The much discussed opening on the Oklahoma Sooners staff for a defensive ends coach has finally been filled by... a defensive backs coach. And, as everyone expected, it's... a recently canned SEC defensive coordinator. I can honestly say I don't know one person or Sooner pundit who ever mentioned ex-Georgia defensive coordinator Willie Martinez as a potential candidate to fill the spot left vacant when Chris Wilson left for Mississippi State. Presumably, Bobby Jack Wright will move back to coaching defensive ends, a position he held during OU's salad days of the early 2000s, and Martinez will handle the secondary. Martinez's record in his nine years in Athens is something of a mixed bag. 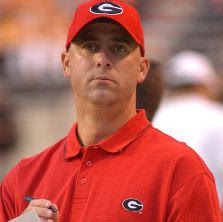 Mark Richt sent Martinez packing after a disastrous 2009 campaign in which UGa fielded one of the worst defenses in the Southeastern Conference, allowing 25.9 points per game (63rd in the country). Stoops didn't hire Martinez to run the show, though. He'll only have to concentrate on the secondary, where he has excelled. In his nine years with the Bulldogs, 15 of his defensive backs were taken in the NFL draft. Equally important, Martinez, a Miami native who played his college ball for The U, has earned a reputation as a crackerjack recruiter with ties all across the the Southeast and Florida. If Stoops really does intend to expand OU's base nationally, Martinez's connections should serve the Sooners well.